The 'Real-Gone Aces' problem is a side branch of the classic four Ace trick. In the classic you place four aces on the table, then put three indifferent cards on each ace, and magically all aces end up in the same pile. 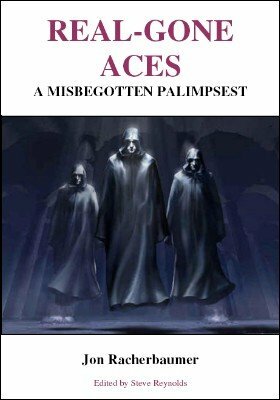 In the 'Real-Gone Aces' plot which was originated by Marlo, after correspondence with Neal Elias, three aces vanish to join an isolated leader ace. If this plot appeals to you then you will learn a good number of variations on it in this ebook. And I am sure, if you are the kind of guy or gal who enjoys reading such detail filled descriptions of finesses and fine points, then you will certainly come up with your own ways to continue to spin the yarn and create further variations or perhaps even develop an entirely new branch on the ace trick family tree. 1st edition 2009; 64 pages.